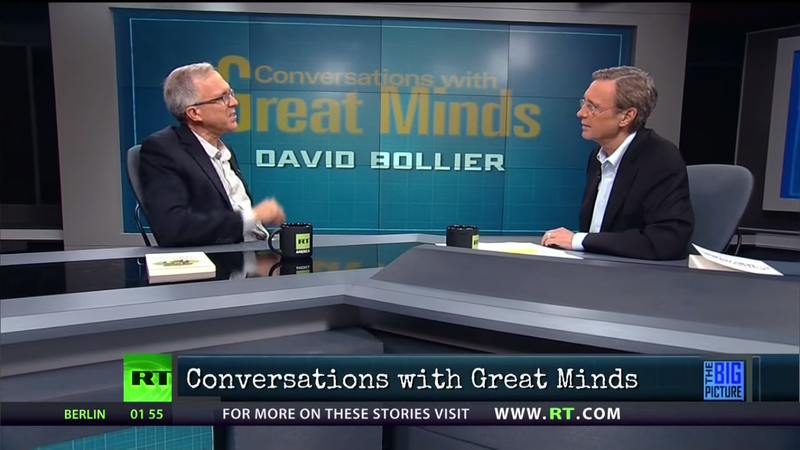 Yesterday evening, Thom Hartmann, the progressive talk show host, interviewed me on his “Conversations with Great Minds” national TV show. The two 12-minute video segments are embedded below. I don’t think the commons has ever had this much airtime on American (cable) television. A big salute to Thom for hosting this kind of material on his show. He is a rare creature on American TV and radio — an intelligent progressive willing to give airtime to ideas from outside the Washington, D.C. echo chamber. Since the retirement of Bill Moyers, there are very few American TV personalities who actually read history, understand how it informs contemporary politics, and give sympathetic exposure to movement struggles seeking social and economic transformation. Since I’m sharing links, let me also share the link to my 20-minute presentation yesterday at Ralph Nader’s conference, “Breaking Through Power.org” conference, which is being held this week in Washington, D.C. My talk, “Controlling What We Own — Defending the Commons,” can be seen here at the timemark 5:35:15. Check out the other presentations on this eight-hour video from Real News Network — some amazing segments by folks like John Bogle, William Lerach, Ellen Brown and others focused on corporate governance, power and financial abuses.